In this episode of Tips & Tactics, sponsored by Cabela's Outdoor Fund, Kristy Titus explains how having a clear sight picture is essential to making precise and accurate shots. When shooting with a rifle, a scope is a great tool that can help shooters see a sight picture that would otherwise be faraway, near and clear. However, taking a shot with the wrong sight picture in your scope will end up hurting your shot outcome. 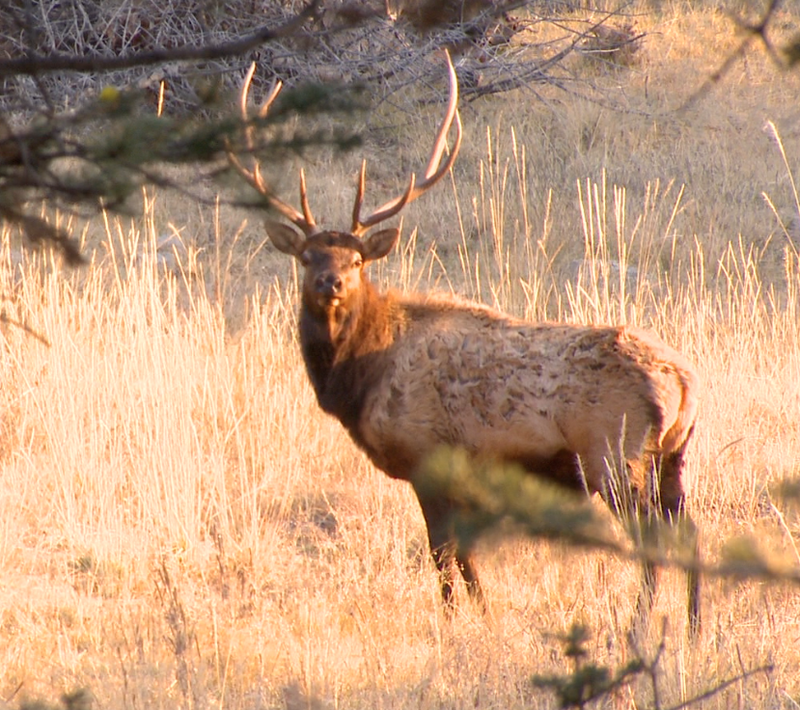 It’s nearly the moment you’ve all been waiting for: elk season opener. Here are a few very simple—yet vital—tips to help you maximize your meat quantity and quality. Correctly processing big game at home can seem like a daunting task, especially if you have little experience processing a large animal such as a deer or an elk. Recently, I spent a couple of hours with my local butcher watching him process deer. Here are the vital tips and tricks I picked up that you need to remember when you take your deer or elk from field to fork. Let’s face it Mother Nature is anything but predictable. Understanding how your cartridge/bullet combination is going to perform down range in regards to both drop and windage is based on ballistic coefficient and other varying environmental conditions that we have to take into account when we determine where the flight path of the bullet is going to deliver successful first round hits. Long range shooters are now paying close attention to ballistic coefficient because bullets with a higher coefficient retain velocity and energy over longer distances. Most manufacturers provide a ballistic coefficient (BC) for their bullets directly on the ammunition box. When possible, try and select a G7 BC for long range shooting, as this BC is a much better fit for the projectiles commonly used for long range shooting. There are various ballistic applications such as the mobile App Shooter or Applied Ballistics program that will allow us to calculate how your bullet will perform in regards to both drop and windage creating a customized chart based on your individual weapon system caliber, bullet type, barrel twist rate, tested average muzzle velocity (not the velocity listed on the ammunition box), density altitude, temperature and wind conditions. Validating your bullets trajectory on the range is one of the most important factors of precision shooting. It is critical that you go out and verify the data from your ballistics program ensuring that you are indeed capable of making the shots from that data derived from your ballistics program at various positions on the course of fire. The data is in part based off the chronograph or magneto speed reading which gives us an average muzzle velocity. That average that we input into our ballistic program may not be accurate in terms of the projectiles true velocity on the range. Use your ballistics software to calculate the required elevation and windage adjustments and dial this on your turrets. For those that don’t have readily adjustable turrets, apply the proper reticle hold over. If your impacts are true to center of the target then your muzzle velocity is good, if however you are impacting high on your target by .4 mils then your true muzzle velocity is actually a bit faster than predicted. Once again, using your ballistics program, you can now reestablish a true muzzle velocity based on your projectile’s impact on the target and create an even more accurate data chart that reflects a true muzzle velocity. This is the data that will allow you to build your dope sheets from. Being able to read the wind however takes time and skill and there is nothing more frustrating than having your bullet trajectory bounce left and right off of the target due to unstable wind conditions. Wrapping your game meat is the final step in processing before the freezer and arguably the most important step. There are many trains of thought when it comes to wrapping game meat but the most important thing that you can do is adequately remove air from your packages. Removing the air will help prevent freezer burn keeping your harvest fresher for longer periods of time. Keep in mind that people eat with their eyes. If your game meat packages are bloody and dirty looking, your guests are not going to be as excited to share in the joy of dining on your harvest. In order to keep your packages clean, your work station must also be kept clean and free from blood or other debris from processing. To vacuum seal or not to vacuum seal? Vacuum sealers are a great worth wile investment that cleanly and efficiently remove the air from your packages extending the freezer life of your harvest. But, vacuum sealers require a financial investment and the seals can fail. My family has processed our own meat for years without the aid of a vacuum sealer with simple white butcher paper, plastic wrap or baggies. 1. Lay white butcher paper out with the waxy side facing your meat. 2. Place an additional layer of clear deli film over the butcher paper. This double layer will help keep the cold air from your freezer from coming into direct contact with your meat which will help prevent freezer burn. 3. Place your first layer of meat on the deli film. 4. Separate additional layers of meat in the package with and additional layer of clear deli film. 5. Use your fingers to “pull” the meat into the layer of plastic wrap that was placed over the butcher paper in step 2. This will help remove excess air from being packaged. 6. Wrap the meat package in the butcher paper. Keeping the wrap as tight as possible. 7. On the outside of the finished package list the species and cut of meat as well as year with a permanent marker or stamp. Life gets busy and it certainly comes in handy to have meat that is frozen pre-marinated so that I simply have to take my meat out of the freezer, thaw and cook. If I am marinating meat, I use baggies instead of flat clear deli film. Here are a few simple steps to follow if you would like to freeze some packages of pre-marinated meat. 3. Place the desired marinate into the bag with your meat. 4. Remove as much excess air from the bag as possible. 5.Wrap the meat package in the butcher paper/deli film. Keeping the wrap as tight as possible. If you have meat that remains from the year prior, be sure to set that aside for immediate consumption. I also like to compartmentalize meat by species and cut when possible which makes for a quick grab from the freezer. With the first snow coming down across the country, predator season is finally in full swing and now is the time to gear up for some snowy adventures hunting the hunters. Young coyotes are still roaming around and pursuit season for bobcats and or lions is open in many states with the full season opening for bobcat hunting here in Oregon in less than two weeks. Now is the time to evaluate gear and get outside and get to hunting. When temperatures dip to sub-zero, dressing in layers is critical, especially when doing any hiking in rough terrain between call sets. Start with a merino type base layer and build out from there, if it is really cold, I will stack on several base layers under a mid-layer pant. I like my mid-layer top to be fleece as it is warm and dries out fast if I happen to fall in a snow bank and get it wet. ;-) My favorite jacket for a mid-layer warmth builder in cold weather is the Cabela’s Primaloft Trail insulator jacket. Primaloft is warm, even if it gets damp and dries out fast plus it is light weight and compresses down. Wearing a vest is my favorite way to add warmth over my fleece top or insulator jacket without the bulk. Always wear an outer layer that is waterproof even if conditions seem dry as weather conditions change quickly in winter months and most waterproof layers double as a great wind barrier. Ladies be sure to check out OutfitHer from Cabela’s. Snow gators will help keep the snow from tumbling into even the tallest of boots and help keep your feet dry should you encounter any creek or water crossings along the way. Bring along AT LEAST two pairs of waterproof warm gloves. Gloves get wet in snowy conditions easily and you will be thankful that you have an extra dry pair or two as the day progresses. One beanie on your head and an additional one in your pack is ideal which is light weight, low bulk, warmth insurance. I keep my extra gloves and an extra beanie in a gallon zip lock bag to prevent them from getting wet in the field. The Shemagh has been used by our military for years and recently, I have incorporated it into my hunts. Kryptek makes a shemagh that will not only protect your face and neck from the cold, sun and elements but you can use it for many purposes like covering your rifle scope from the elements, shade the sun from your eyes while glassing, I have even covered my head with the shemagh while shooting to keep sand out of my eyes. The Pinnacle BOA boot by Cabela’s is my go to boot in winter conditions. The boot is waterproof breathable GORE-TEX and tall enough to defer snow that is knee deep, insulated and the BOA system keeps my boot tight and on my feet without laces. The NEW Instinct boot is GORE-TEX waterproof and has 400 GM Thinsulate Insulation, great ankle support and is STIFF for walking in steep, rough terrain. Cold feet? Thermarest heated insoles, quickly and easily slip into your boots providing you with warm toasty heat during your calling sets. You can even turn off the heat when walking to save battery life and ensure that your feet don’t overheat. For pursuit hunting with hounds, a quality pair of crampons are a must in mountain terrain. Covering mountain miles without a good pair will wear you out! The added traction will make your hike slide free and much easier. And for all the slipping and sliding that you might do, a trekking pole is a great add when navigating rough, steep, snowy terrain. If your buddies make fun of you for your stick, when they struggle up the mountain, poke it at them and just laugh. You will be thankful you have it and they will wish they had one too! Mouth calls from Rocky Mountain Hunting Calls are my favorite hand held. They have a selection of jack rabbit, cotton tail, rodent and fawn distress sounds. Coyote and wolf howling systems. You can even use a cow call diaphragm to make calf elk distress sounds. If you are no expert with mouth calls, check out Cabela’s Outfitter Series predator call by FoxPro. It comes loaded with 35 sounds and you can customize by adding more sounds that you can download online. I like to use electronic calls because it moves the sound away from you as the shooter allowing for the predator to come within range without being seen as easily. BONUS: The Outfitter Series electronic call comes loaded with cougar and other fur animal sounds like raccoon sounds that are not easy to or even possible to replicate with a mouth call. Decoys work because they give the predator a focal point to watch when coming in. Montana Decoy makes coyote, rabbit and fawn decoys that are realistic and give your call set life. Some states even allow moving decoys. Check your local regulations to see what rules apply to your state. Cabela’s Speedy Yote Kickstand vest has pockets to hold all of your calls and give you a comfortable seat while in the field that insulates you against the cold ground. A good quality backpack that you like will surely help tote along all of your necessary gear. Kitchen…yes, I dare say kitchen while hunting. I am a girl for heaven sake so it is natural to bring along everything, except the kitchen sink (A gallon of water will suffice). There is nothing more delightful than a hot cup of coffee or lunch in sub-zero temperatures. MSR reactor stoves or Jet Boil stoves are light weight and boil water quickly so that you can dine on a hot lunch from Mountain House or sip fresh hot coffee, all day long. You can opt to put the kitchen in your pack or leave it at the truck. Either way, EVERYONE will enjoy. I promise. Good optics are a must have and will help you spot predators from distance allowing you the opportunity to place a well-planned out set without spooking them or alerting them to your presence. A range finder is a must have so that you can easily and quickly dial your rifle turret for point of aim, point of impact shots. A tripod shooting rest or a hog saddle mounted on your tripod is a must when stand hunting for predators. It will allow you to stay comfortable and supported behind the gun throughout your entire set. Don’t forget the small stuff that matters. Bring at least one extra set of batteries for your flashlight and predator call. The cold air drains batteries quickly. A few hand or body warmers remove the chill of the winter weather without adding bulk. Your GPS with OnXmaps will provide valuable land owner information allowing you to access areas that you might not have known were public land. The winter has arrived and as I write this, I look out my window at over two feet of snow. Already, I am looking forward to the fall of 2015. Fortunately, there are many hunts and opportunities to get out on the mountain before then. The magazines that I subscribe to accumulate most of the year and I take the time to sit down and read them during these short days, dreaming about the hunt. 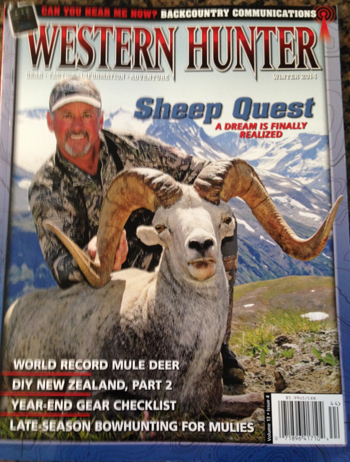 Western Hunter Winter issue just landed in my mail box and inside there is some great articles. South Cox wrote an article that I found very interesting on satellite communication and texting while on the mountain. Looks like with his tips, I need to upgrade my technical or lack thereof equipment. Chris Denham's Gear Product Highlight of the new Swarovski STR 80 Spotting scope has me drooling for one! My shooting schools next year will be so much more amazing with this scope. No more will I have to look through my rifle scope to act as spotter for my shooting buddies. The scope will allow me to be over my shooter and better watch bullet trace for better calls. 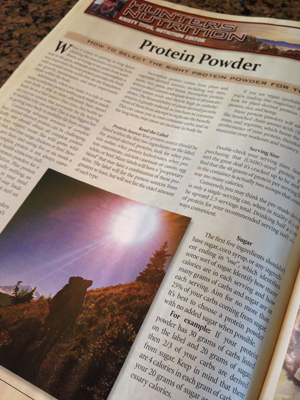 My editorial Hunters Nutrition, featured a little run down on what to look for when buying a protein powder. If you don't subscribe to Western Hunter and Elk Hunter Magazines, you should. Inside, you will find a lot of great information that will make your 2015 season more enjoyable and hopefully more successful all while passing the short days and long winter nights by. The animal of your dreams is in your crosshairs. One press of the trigger and all your dreams will come true … as long as you took the time to make sure your equipment won’t fail. Click HERE to read my latest editorial for North American Hunter online before heading into the field this rifle season. The November/December 2014 issue of the Rocky Mountain Elk Foundation's Bugle Magazine, Gear 101 featured the latest and greatest in gear and clothing specifically for women and kids. It is no suprise that Cabela's OutfitHer and Meindl footwear for women was on the top of discussion. Conservation. Hunting. Wildlife and Wild Places. 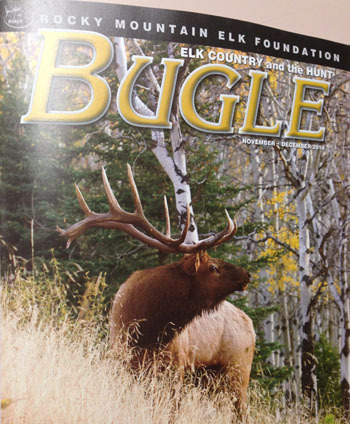 Bugle magazine puts all of the pieces of elk country together in six exciting issues each year. When you become a member of RMEF, you help ensure a future for elk and other wildlife, while getting the very best of elk country and the hunt. 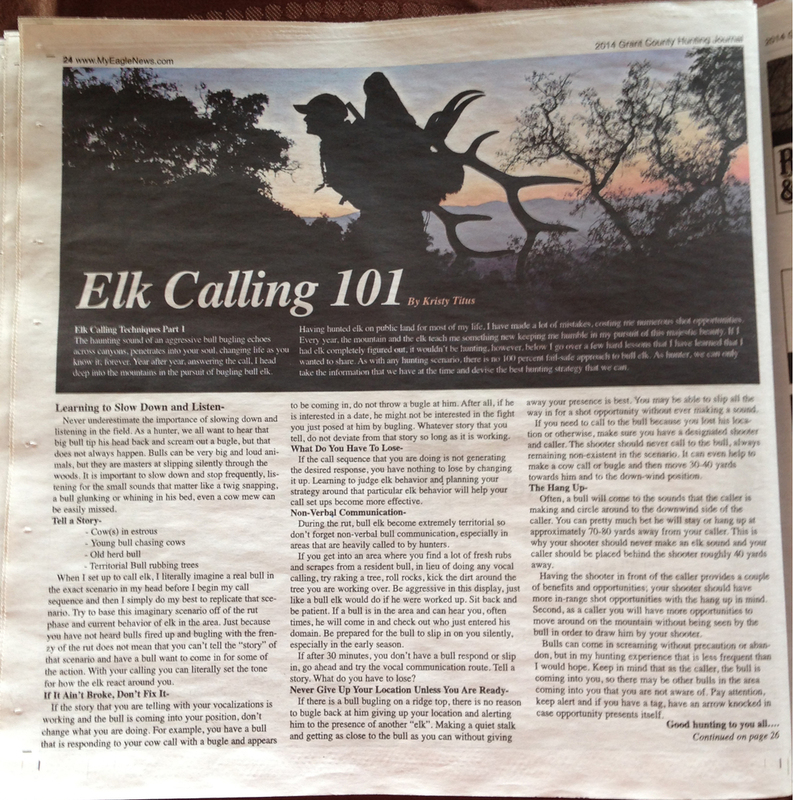 Through the pages of Bugle, we hope to inspire every RMEF member to help us do more to protect and enhance elk country. We like to explore issues affecting wildlife conservation, elk ecology, and hunting. We also really enjoy sharing good hunting stories and some of the best wildlife photography today. It’s nearly the moment you’ve all been waiting for: firearms whitetail season opener. Here are a few very simple—yet vital—tips to help you maximize your meat quantity and quality. Correctly processing big game at home can seem like a daunting task, especially if you have little experience processing a large animal such as a deer or an elk. Recently, I spent a couple of hours with my local butcher watching him process deer. Here are the vital tips and tricks I picked up that you need to remember when you take your deer from field to fork. The most important aspect to hunting success is the person behind the gun selecting a suitable bullet type and weight that affords maximum terminal performance for the intended game animal. Hunting bullets are designed to terminally perform in different ways for specific hunting purposes which varies from varmints to big game. The bullet we pick will change depending on the quarry we're hunting. Click HERE to read the editorial in North American Hunter online. Good health is the starting point to all of our outdoor adventures. Our bodies are the vehicles we use to climb to the mountaintop in search of that trophy of a lifetime. 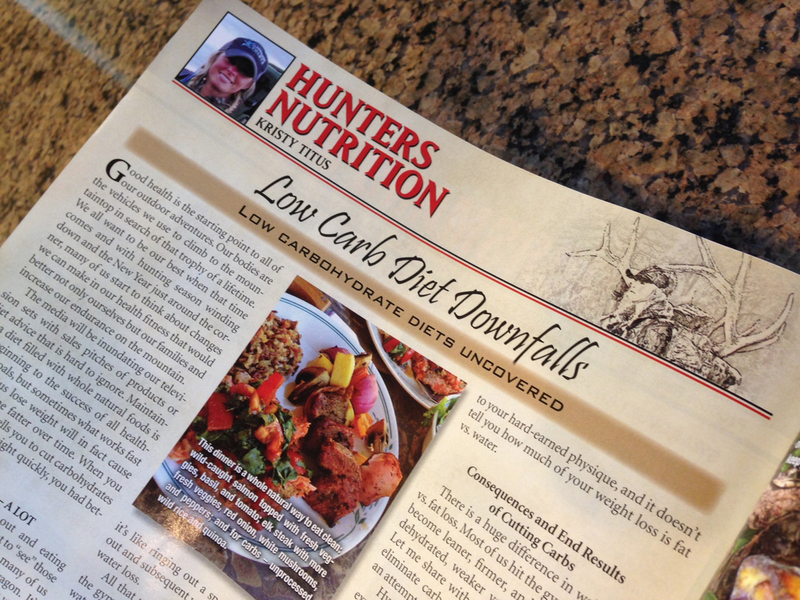 In the Winter issue of Elk Hunter Magazine's Hunters Nutrition, Kristy discusses the pitfalls of low carbohydrate diets. In every issue of Elk Hunter Magazine you will find extensive and frequent reviews of a wide range of products from optics to boots, rifles to bows, and much more. Elk Fit and Hunters Nutrition- Being fit enough to hike the mountains and pack out your game is critical. This topic is under-appreciated and under-appreciated. We talk about fitness tips, strategies, and the mental side of getting tough. Dan Staton and Kristy Titus are a formidable team in taking care of your body and improving your overall health. This isn’t just about hunting; this is about quality of life! You’ve filed your tag with the trophy of a lifetime and you want to create a stunning rug, shoulder or life-size mount. Many sheep, goat and bear hunters might find themselves backpacking for days before they can bring their trophy in for refrigeration or get it to a professional taxidermist. This is where you, as the hunter, must ensure that proper care of your animal is taken in the field. But rest assured, this skinning method will work just was well if you hunt on your own Back 40. When you’ve harvested that trophy of a lifetime, before you field dress and begin skinning, there are a few simple steps that you will want to take in order to ensure that your taxidermist has all of the needed information to mount your animal perfectly. Grant County Oregon holds promise of a life lived at a slower pace, friendly people, spectacular scenery and more Boone and Crockett Rocky Mountain Elk entries than any other area in the state. The area holds excellent habitat for elk, deer and other wildlife, making it a favorite destination for outdoorsmen and women alike. welcoming in many non-resident hunters as well as local hunters. The Grant County Hunting Journal features articles, tips, area information and local stories of hunt success. If you are in the area, make a stop at a local restaurant or hardware store and pick up a copy. 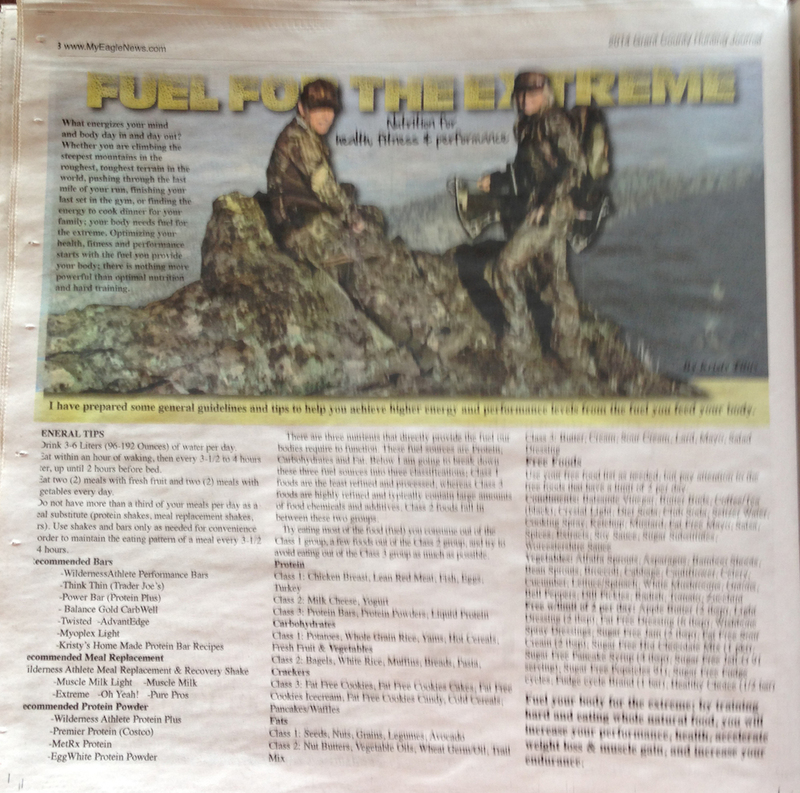 Inside, you will find several articles that I contributed on GPS use, elk calling and hunting tips and strategies as well as a few tips to fuel your hunt with nutritious meals. Wishing all of you safe travels and good hunting. One cannot predict what’s going to happen on the mountain in pursuit of elk. This anticipation keeps hunters returning year after year, and each step of the hunt holds its own unique experience. Hunting elk is my passion and my life. Here, in part 2 of 3, are a few tips and tricks I’ve picked up through experience that I hope bring you success throughout this hunting season. Hunting elk is my passion and my life. Here, in part 1 of 3, are a few tips that I hope bring you success during the early season. The time-honored tradition of hunting has changed and evolved with the advancement of optics technologies. Coupling optics advancements with proper technique will save time, energy and ensure you don’t miss spotting that animal of a lifetime. I feel so blessed to be able to share some of the techniques that I have learned while training with Magpul Dynamics. Here is my latest editorial. I hope this brings you all success this hunting season. Having a prone-length bipod mounted on my hunting rifle has been one of the best investments I’ve ever made, helping to stabilize my shots while in the field from not only the prone position, but kneeling, sitting and standing, too. A gun-mounted bipod creates a more stable shooting platform for a quick and accurate in-the-field shot than is possible with a backpack, log, fencepost or rock. North American Hunter- How Well Does Your Rifle Fit You? In the field, one does not rise up to the occasion but instead falls back on training. You’ve put in countless hours scouting, training in the gym and dreaming of this moment. You’re ready. But will you have the same level of confidence and competence this hunting season with your hunting rifle? Let’s face it, when in the field, Mother Nature is anything but predictable. As a hunter, it’s our ethical responsibility to understand our own individual gun or bow system, learn how it works and what we can do to improve upon it, and know its limitations as well as our own. No matter how long we’ve been hunting or shooting, there are new skills and tricks that can be learned and applied. In my latest editorial for North American Hunter online, I go over a few tips to modify your rifle to fit more properly before your next hunt. The North American Hunter Magazine is circulated to nearly 1 million households around the world taking pride in being in the know in regards to all things hunting. Everything from finding that big buck in your woods or planning the next big hunting adventure. North American Hunter Magazine has underwent a huge facelift, now featuring a large format, a true hunting lodge table top magazine featuring three newly added sections, a hunting section, an outdoor section and hunt club content. With all of these changes, I am honored to announce that NAH has added me to the list of magazine editors as fitness editor with a column entitled The Extra Mile, to the now seasonal publication. The Spring/Summer issue, featured Spring Training Preparing to hunt black bears and maul the mountains one step at a time. You are all invited to visit www.huntingclub.com and see for yourself how North American Hunter Magazine has changed. I hope that you enjoy the new NAH Magazine.